Does your family need some Friday night plans? 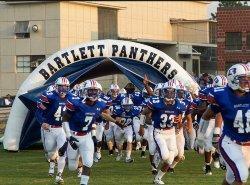 This Friday night is Rivercrest night at the Bartlett High School football game! Families will be allowed on the field to cheer as the Panthers take the field against the Arlington Tigers. All families must be at the visitor’s gate entrance no later than 6:30 pm to be able to stand on the field before the game. Student tickets will cost $1 & adult tickets will cost $5. A small red coupon is being sent home today. You must present this at the game to receive those discounted ticket prices! Don’t forget to wear your Rivercrest red! We hope to see you there!